• EVERY BATTLE DEFINES YOU: With every match you’ll earn gear to equip, customize and evolve your favorite DC Super Hero or Super-Villain, meaningfully impacting how your character both looks and fights. • THE BEST OF DC: Choose your character from the biggest DC Universe roster a fighting game has ever seen – from classic fan favorites to astonishing new villains. Battle across iconic locations such as Gotham City and Atlantis in epic scale battles that use and destroy everything around you. • BUILT BY NETHERREALM: Developers of the best-selling and critically acclaimed MORTAL KOMBAT franchise, NetherRealm Studios brings unrivaled storytelling, robust content, and best-in-class fighting mechanics to the DC Universe. Injustice 2 should satisfy your need for superhuman scraps, dividing the DC-verse into two sides. 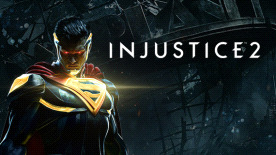 Injustice 2 for PC delivers a one-two combo to the faces of all your favorite DC heroes and villains, letting you uppercut people into space as Superman, or even punching them back into the prehistoric age before slamming them into a T-rex as The Flash. Injustice 2 key characters include Brainiac, Nightwing, Robin, Batman, Supergirl, Cyborg, Aquaman, and more - all of them facing off in grimy arenas as you fight your way through a wealth of single-player content. There are endless challenges to be found in the Multiverse, and two sides of the same tale in an excellent single-player story mode. Once you are feeling confident, head online and punch your friends into last week. If you like competition, buy Injustice 2 for PC at Green Man Gaming and receive your Steam key ready to play come release!